The Palm Restaurant in London is an American steakhouse that first opened in New York in 1926 and which has since grown to several dozen restaurants throughout the United States. The London branch feels American through and through, and is located on Pont Street in Belgravia, right next to the Belgraves Hotel, a destination hotel for many American tourists. It is therefore unsurprising that most of its clientele are Americans, like the ones we spoke to while we had a drink at the bar. It’s a classic American steakhouse through and through with its white-linen tablecloths, soft lighting and booth seating, and it suits the well-healed clientele of Belgravia well. 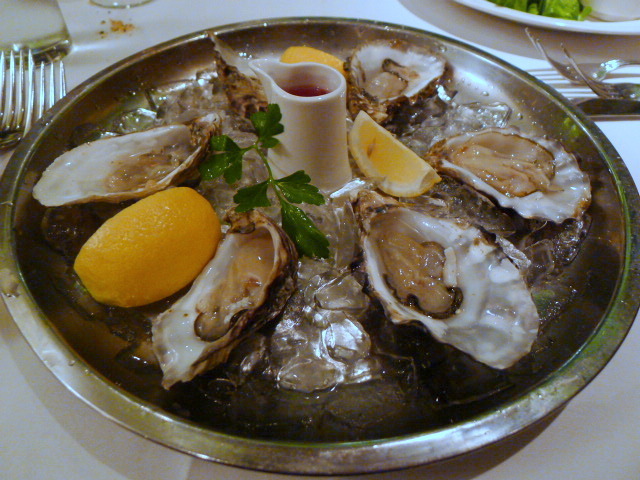 For something reasonably light to start ahead of our big meaty meal, we went for the half a dozen Colchester oysters on the half shell (£13), which gave way to a sea-salty flavour and rich texture. 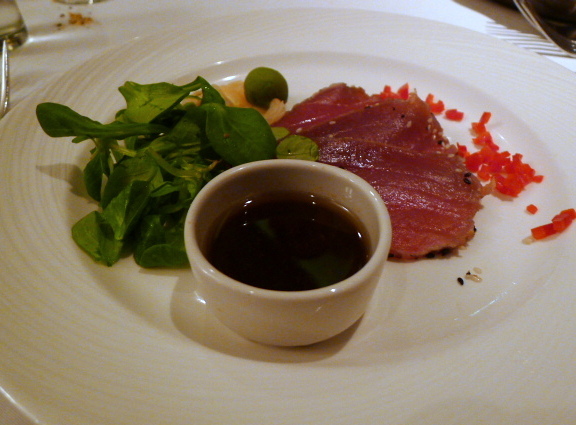 Also yummy was the beautiful sesame seared yellow fin tuna (£15.90) with pickled ginger, wasabi, mache greens and ginger vinaigrette. It was a delight to eat and it needed little by way of accompaniment because the fish was elegant and flavoursome. But steak is what Palm Restaurant is known for, especially its USDA selections of prime and choice cuts of steak. To help you choose, a platter of steaks and an explanation of the cuts is presented by the waiter. US steaks come from corn-fed cows, which typically results in a greater marbling and a fattier flavour. There was a sprinkling of British steaks on the menu as well, but it was difficult to get past the prime US steaks of New York strip (340 grams – £42.90) and prime boneless rib-eye (400 grams – £42.90). The New York strip is the gold standard in US steaks. It is cut from the short loin, a well-marbled muscle that does little work to give it a deep flavour and supreme tenderness. This was a sublime piece of meat, particularly so from the beautifully marbling, and perfectly cooked to a medium rare. For the sauce, a ‘Classic Oscar’ of jumbo crabmeat, asparagus and hollandaise sauce (£7) did not appeal as the crabmeat was a little bland. The prime boneless rib-eye was also juicy, tender and extremely flavoursome. Also medium rare, it had just the right amount of fat and grain running through it for the perfect balance of taste and texture. Both pieces of steak were excellent, and it was truly difficult to pick a favourite from the two. 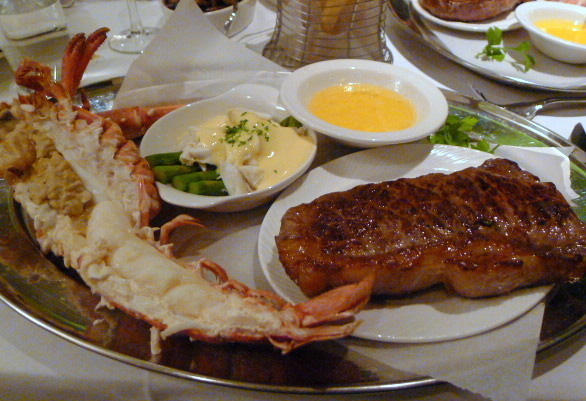 We ordered the steaks as a ‘surf-n-turf’ and shared a steamed Nova Scotia lobster (2 pounds – £39.90) between the two of us. The lobster, served with clarified butter, was meaty, but could have done with a few minutes less cooking to hold in greater flavour. But truth be told, the steaks were so fabulous they really didn’t need either the lobster or a sauce. 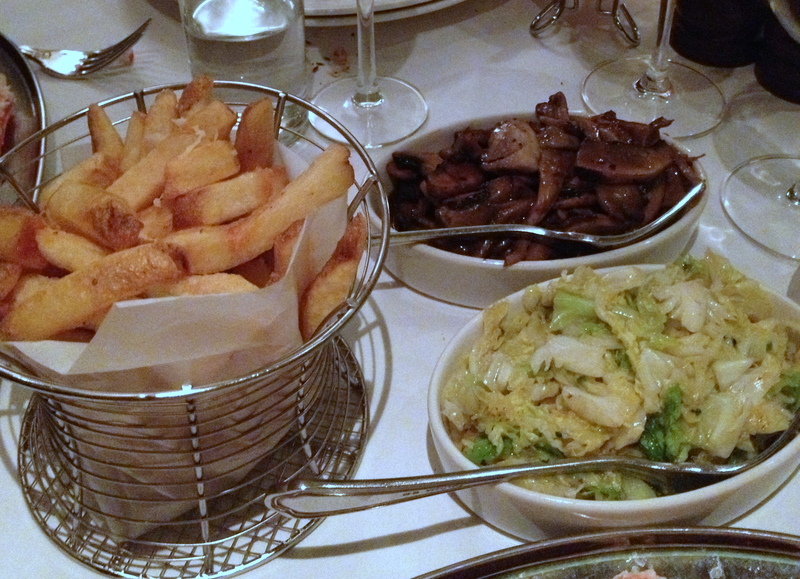 We tried a number of sides and a generous portion of hand cut French fries (£6) with parmesan and garlic was truly fantastic. They weren’t particularly cheesy or garlicy, but they were super crunchy and really tasty. In contrast, wild mushrooms (£7) had a strange tang to them and tasted odd, but seasonal vegetables (£6) of braised cabbage was delicious and well seasoned. To desserts, and a key lime pie key with a lime custard (£6.50) was refreshing with a dreamy texture, but it needed a touch more lime for a greater zing. The graham cracker base was also excellent and oozed with lots of buttery goodness. 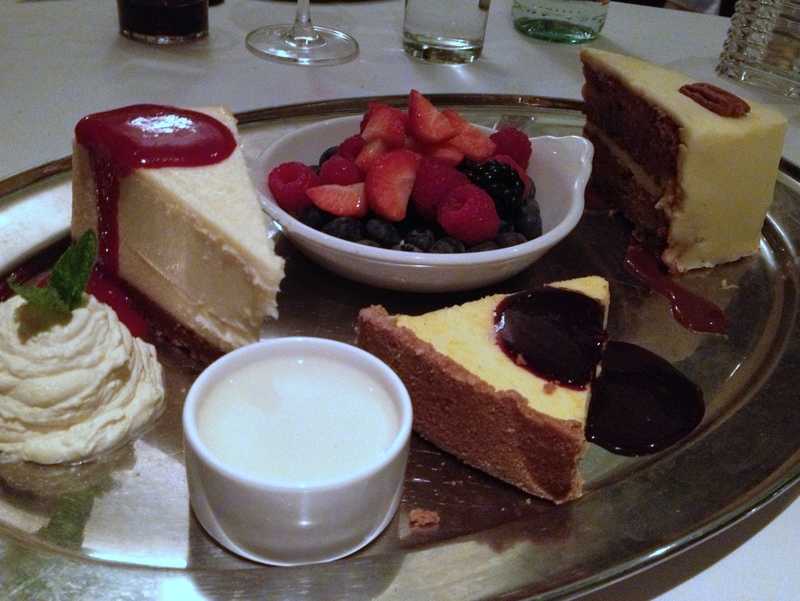 Also classically American was a New York style baked cheesecake (£7). It was mouthwatering with a dense, smooth, and creamy consistency. A drizzling of raspberry coulis also helped to lift the cheesecake by giving it a fruity contrast. An ‘American’ carrot cake (£6.50) with a cream cheese filling was denser in texture than the typical carrot cake. But it was moist, nicely spiced, and there was a slight nuttiness coming through from the use of pecan nuts. We adored the steaks as the quality was excellent. We also enjoyed the freshness of the seafood starters (but less so the lobster), and the desserts were delightful. The service was also pleasant and overall one would have little to quibble about. 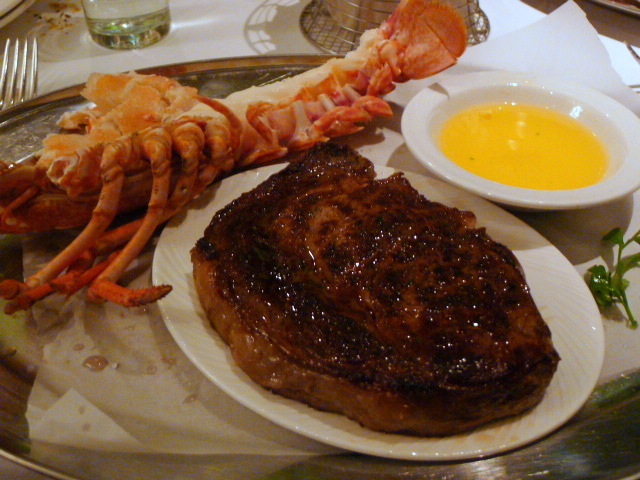 But prices of the steaks were comparatively expensive – about £43 for a prime USDA steak. However, if you want a touch of Americana, then The Palm Restaurant is an ideal spot to find some. Prices: About £28 to £72 for three courses, excludes drinks and service. Your blog wakes the interest in any of these luxury restaurants, why cook at home when you can enjoy a diner in one of these fantastic places? Thank you so much for posting!